Pending some last minute schedule changes, Friday night's 4-3 loss to the LA Dodgers was my last Giant's game of the season. I have no clue what my record for this season was as I probably went to 20-30 games this year. They won some and lost some. Oh well.. World Series 2007! Here's one last image that I think summed up the season. Matt went with me to the game on Friday. This is him smiling on the right. 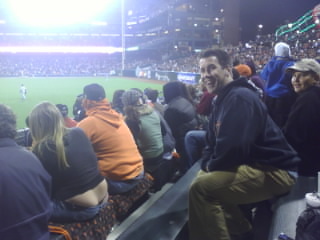 Notice the female Giant's fan in front of him. Enjoy! Blog Etiquette - Is there such a thing? So what's next for Big Al?